"In this book, Daniel B. Davis has proposed an important practical tool for addressing the contingent faculty crisis and ensuring that all stakeholders participate in the transformation of higher education into a site of authentic excellence, and commitment to equity and equality." Contingent Academic Labor by Daniel Davis is a timely, relevant, and necessary text that pushes us all to reconsider the treatment of non-tenure track academic faculty and the implications this treatment has for students. 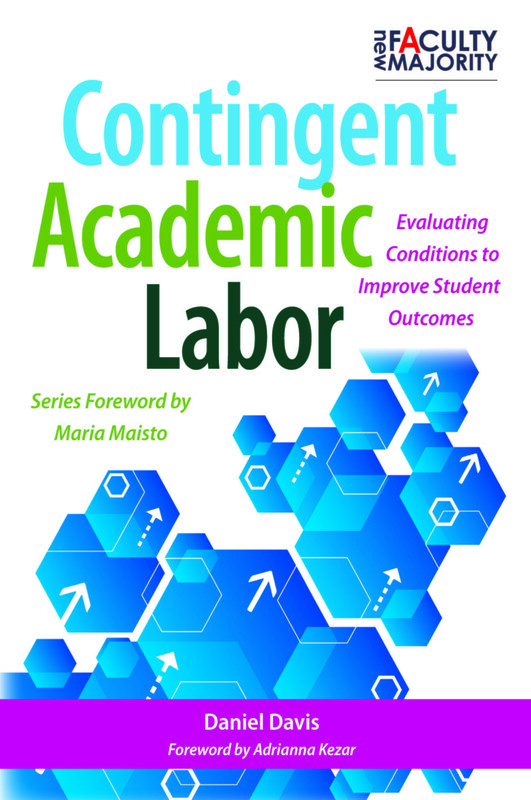 The book is an organized and concise work targeted at all who are (or should be) concerned with the treatment of contingent faculty: faculty, students, administrators, researchers, labor unions, etc. This work builds off of successful tools geared toward advancing equity in higher education like the Equity Scorecard (Bensimon, Hao, Bustillos, 2006) and offers a useful gauge for campus stakeholders to take the temperature regarding contingent faculty treatment and experiences in higher education. In the introduction, Davis sets the stage for the present conditions contingent faculty face working in a higher education environment that underpays, undervalues, and under-employs them. Despite the growing number of contingent faculty members, their treatment indicates higher education has taken for granted their import to student success. Davis divides the book into three parts so that the reader first has a foundation of the broader context and conditions of academic labor. He then depicts the variety of working conditions for contingent faculty and ends with an overview of the utility of the Labor Conditions Score developed to aid higher education institutions in assessing the environments in which their contingent faculty work. It is clear that no one wins with the present treatment of contingent faculty members. One participant interviewed for this work said, “I don’t understand why this situation persists when it’s a lose-lose-lose scenario. There has to be a better way” (p. 22). When the faculty members are struggling to survive, they oftentimes cannot recognize or address the challenges students face. The use of a tool like the Contingent Labor Conditions Scorecard can help move institutions towards maximizing student experiences and outcomes. The tool can also help better assess the feelings of contingent faculty members in their current roles. The text will certainly prompt additional discussion and direct attention to this important topic of contingent faculty, and hopefully those who read it will push for institutions to convert the knowledge shared into meaningful actions that will benefit all campus stakeholders. Daniel B. Davis is a PhD candidate in sociology at the University of California, San Diego; a Kauffman Foundation Dissertation Fellow; half-time faculty at Point Loma Nazarene University and a lecturer at San Diego State University. He has published articles on student college-to-career pathways in Sociology of Education and Research in the Sociology of Organizations. Davis previously researched undergraduate educational outcomes with CREATE (The Center for Research on Educational Equity, Assessment and Teaching Excellence) at UC San Diego. He has taught dozens of college courses in various settings, including private and public, community colleges and four-year universities, online and face-to-face. Across these institutions, the range of working and learning conditions Davis encountered was vast, with the highest-paying campus offering compensation four times greater than the lowest-paying institution. Some of the positions had benefits and reasonable security of contract; others had neither. The sense of professional inclusion—through designated office space, invitations to department events, and more—was substantial at certain campuses and non-existent at others. It was the experience of these disparate working conditions, their impact on Davis’ sense of professional engagement, and their effect on his students that motivated him to write this guide. Click here to visit Daniel's professional website.